Renaissance Catering » Blog Archive » The ink is running! In our fast paced world today, it’s not always possible to read. There’s so much going on with people working, keeping up relationships, taking care of the little day to day things. Reading is a luxury, but for those who choose to engage in it, reading is a magical escape. Countless worlds are open to you, and hundreds upon thousands of characters become close friends, we form a bond with them. These characters and stories become so integral to our lives that sometimes we can’t let them go, we can’t let the story die with the last page, last sentence, last word. Sometimes, you want to bring the world to life, to live in it and to immerse yourself in it. It’s a magical experience, and some would say that marriage is it’s own magical experience. 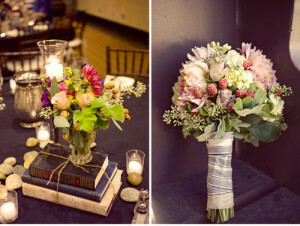 Why not add elements of your favorite series of books into your wedding reception? If you’re a J.R.R. Tolkein fan, why not have some stew with potatoes? Why not make some lembas bread? Maybe you’re a big Steven King fan, and you want some redrum at your event! Redrum cake would be a deliciously spooky treat! Willy Wonka and the Chocolate Factory offers up so many choices for great dessert ideas. There is literally endless combinations to choose from, and no guest is going to be disappointed that you offered up a variety of candies! Maybe have some scarlet A cookies, if you’re a fan of the novel! There’s no limit to the choices you can make and what items you can come up with to be serve! Think of your reception as being a blank page. There’s nothing written down yet, there’s nothing barring you from letting your imagination run wild, just as it would while reading a book. So just sit back, relax, and crack open the book of your future, and write the story as you go.